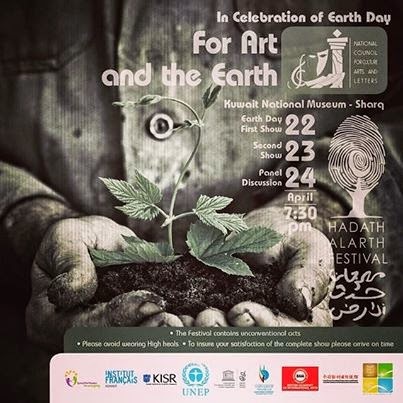 To celebrate Earth Day, Hadath Alarth Festival for Art and the Earth, a two day event will be held on the 22nd and 23rd of April 2014 at the Kuwait National Museum theatre, organized by the Ministry of Youth Affairs in participation with the NCCAL, National Council for Culture Arts and Letters. Earth Day celebration is being held to promote protection of the environment. Renowned musician and composer, Nawaf Gheraibah and his talented troup of musicians will hold a concert on both days and it's definitely a not to miss musical event. I have been waiting to attend Mr. Gherabiah's concert. Mural art work will be presented by Visual Therapy to symbolify 'there is no life without water'. There will be a performance organized by L'Institut Francais du Koweit, 'Quidams Proud Horse' show. Horses carved in large inflatable material over 3.50 metres in height will be put into motion by puppeteers in bold costumes. A herd of horses (two to nine), made of white and ivory materials, symbolizes peace, purity and spirit. Aérosculpture troupe will present the show chromatic Envolée. That's all I know for now. Will update if I come to know of any more details. *Update : I heard there will a variety of programs by number of local, regional and international artists who support living in a clean and protected environment. Besides the musical stage presentation, there would be poetry recitals as well. We are hoping to attend the event on Wednesday. Celebrate Earth Day and offer your support to care for our environment. Minister of Youth Affairs stated that Kuwait is a signatory to the Kyoto Protocol to the United Nations Framework Convention on Climate Change which is an international treaty that sets binding obligations on industrialized countries to reduce emissions of greenhouse gases. Earth Day is an annual event, celebrated on April 22, on which events are held worldwide to demonstrate support for environmental protection including Kuwait.